Create your own fractal art. Is there a better alternative to Ultra Fractal? Is Ultra Fractal really the best app in Illustration category? Will Ultra Fractal work good on macOS 10.13.4? 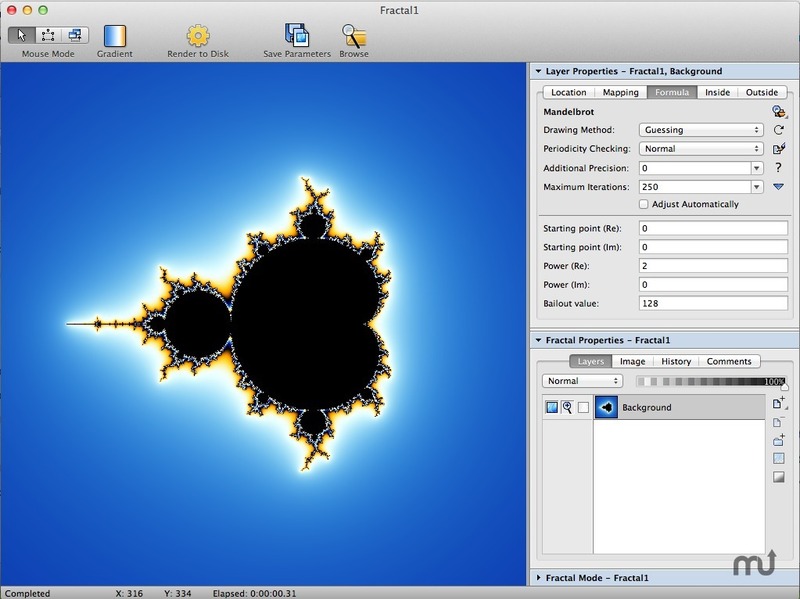 Ultra Fractal is a great way to create your own fractal art. Today, fractals are much more than the Mandelbrot sets that you may have seen before. With Ultra Fractal, you can choose from thousands of fractal types and coloring algorithms, zoom in as far as you want, use gradients to add color, and apply multiple layers to combine different fractals in one image. Ultra Fractal is very easy to use and yet more capable than any other fractal program. No mathematics required! Fixed a bug that caused the priority of fractal calculations and display updates to be too high, reducing general responsiveness. Fixed a bug that prevented the histogram in the Statistics tool window from being drawn at all. Fixed a bug that caused license keys with accented letters to be rejected. Ultra Fractal needs a rating. Be the first to rate this app and get the discussion started!